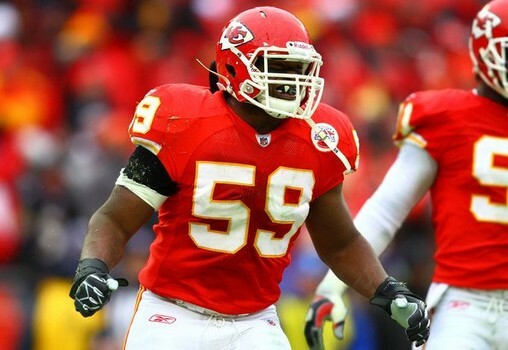 The weekend saw a terrible tragedy unfold with young Kansas City Chiefs player Javon Belcher murdering his girlfriend before taking his own life in front of Chief’s head coach Romeo Crennel. Those words still don’t really make sense, it was such a senseless and tragic loss of life. Furthermore, the tragedy will linger, as Crennel (who it must be noted sounds as if he behaved with extreme bravery, trying to talk sense into a volatile man wielding a hand-gun) and other Chiefs players and staff will never be able to forget what they saw. Finally, Belcher’s baby daughter is now going to grow up without a parent. The last part perhaps resonates loudest, as you can only imagine the challenges the poor girl faces, her life altered forever by a hand-gun. Across the sporting media there have been all sorts of responses, coming from different places in the mind and heart. Fascinatingly, the two that most visibly dared to suggest this might be the time to consider a new look at the very least at gun control are the two that are coming under the most derision. Bob Costas and (to a lesser extent) Jason Whitlock are being dragged around the muddy corners of the Internet and verbally lambasted as if they were the mythical love child of Osama Bin Laden and Eva Braun. Costas, in particular, is being torn to shreds by, largely and not surprisingly, the right wing slanted sporting and other media, perhaps because his plea for consideration was witnessed by a larger audience, and, it has to be noted, a Southern audience (it being a Cowboys game). You have to wonder, why are Costas and Whitlock being subjected to such hate filled vitriol? All they are doing is offering their opinion, and in same they simply suggest that this horrible tragedy affords a moment where we could look at gun control again, and consider a way forward that doesn’t involve the continued massacre that is being facilitated by the free availability of guns in the United States. How is offering that opinion now an open invitation to ridicule? Surely if people want to make the United States a safer place, that is to be commended, or at very least accepted? I completely get how gun manufacturing companies, the people who work for them and the politicians who’s pockets are lined by those companies would angrily rebuke the opinions of Costas and Whitlock. You can always expect the angry, bobbing head, cap-typing right wing to get in on the act also. However, what about the rest, why is Costas in particular being carpet bombed like this? Seriously, the man simply suggested maybe we should consider how easily anyone can get their hands on a gun in the USA. Is that such a bad thing?! Has the USA become that completely immune to the rampant issue of gun related deaths that if anyone dares challenge the ridiculously powerful gun lobby they get destroyed by the sporting and other media at large? Did Bob Costas and Jason Whitlock really write something that bad that it deserves the derisive assaults they are being subjected to today? The attacks are pretty much as you would expect them. The usual ‘Guns don’t kill people’ dross, combined with various demands that the constitution remains intact. One that appears to be rearing it’s infantile, ugly head again and again is the ‘He can try and take our guns’ refrain. ‘Our’ guns, really? Maybe that’s what drives the right-wing so crazy. At its heart, the debate isn't even a contest. Only an idiot of the lowest order would agree that the ‘right to bear arms’ is more important than human life and peoples safety. Lacking any sensible argument, the right flips on the caps lock and lets rip. When people point out how simple and ludicrous the whole situation it, people like Costas and Whitlock, they get assaulted by the cowardly mob. Sadly, that has become the norm, and that appears to be what we are witnessing here, a sad footnote in a terrible tragedy.